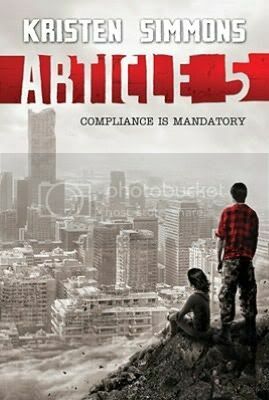 Article 5 had been sitting on my shelf for a couple of weeks now. After discussing it with a fellow blogger, I decided to move it up on my to-read list. I am SO glad that I did! Imagine a world where you lived by a code of morals instead of the rights we have now. There is only one religion. Immoral literature and media has been banned. Families must consist of one man, one woman, and child(ren). A child can only be a valid citizen if he/she has been conceived by a married couple. This is the frightening world in which Ember Miller lives in Article 5. I must start off by staying, that whenever I read a dystopian novel, I always find it shocking that stuff happening in the book could totally happen in real life. I absolutely cannot imagine living in a world where we don’t have freedom and rights. That definitely makes it easy to sympathize with the main characters in the story. I was a little worried about the main character, Ember, in the beginning of the book. At first, she gave the impression of being very docile. However, she does grow more determined through the book. I was very glad to see what. All the poor girl wants is to save herself and her mother. Chase, who Ember has known since her childhood, does whatever he has to do to help Ember with her search. I love Chase. He’s dark and mysterious, and you just want to know what his story is. He definitely earned a spot on my favorite hero list. The plot for the story is definitely interesting. I’ve read a lot of dystopian’s lately, and I was a little bit worried that this wouldn’t hold my attention. It certainly did, I shouldn’t have worried at all. The book was well paced as well; I was flying through the paces just to see what was going to happen next! Overall, this was a really great read. I can’t believe I waited so long to get started on it. I can’t wait check out the next book in the series, so I can see what’s going to happen next with Ember, Chase and the crew. Thanks a lot for your review, Christy! This was truly a scary future. Just look at what our government's trying to do to women at the moment--it's a completely feasible dystopian world in Article 5! *shudder* Looking forward to seeing what happens next in this series, though. I have this one on my wish list. I reall do enjoy a good dystopian. I'm glad that you enjoyed this one. So happy you liked this one too! I also get really terrified that most of these dystopians could totally come true! It's scary and makes them really fun to read. Great review! I've been wanting to read this one ever since I heard about it !! I haven't read a lot of reviews on this one but the few I've read were really positive, just like yours !! I really look forward to visit this word even if it seems a little frightning as I could definitely see some of the things you talked about happen .. Thanks for the awesome review Christy !! I just finished this one too and ADORED it! That world terrified me, and I was so angry when she was in "rehab" I could barely turn the pages without tearing them. Loved all the tension in Chase and Ember's relationship too, I can't wait to see how things with them progress! Have a great weekend Christy! This make me want to move it to the top of my TBR pile. Great review! Don't you just love how main characters do a 360 on you and you're happily surprised by how much you like them? I love that! This book is such an AMAZING, wrenching read that I couldn't put down, nor did I ever want to. So good, the romance so delicious. So glad you liked this one! I'm glad this one is fantastic! I have it on my shelves but haven't got around to it yet. Chase has definitely piqued my interest! :) Great review, Christy! I've read some conflicting reviews for this one, so I'm glad to hear you liked it! It's always good to hear that the main character goes through character growth and that the pacing kept your interest. Definitely one I'll read in the future! I found the concept of this story frighteningly probable but the characters themselves didn't work for me. I found Ember inconsistent and Chase not swoonworthy so they spoiled the story for me. This was the book that got me off a reading slump. It's definitely a fantastic addition to the dystopian oeuvre. I particularly appreciated how it felt complete enoug as a first book that, while I'm looking forward to book two, I'm not banging my head against the wall waiting for it.